I read an article on the internet about a polar bear that had died in Svalbard and the propaganda being put forth about global warming was nauseating. 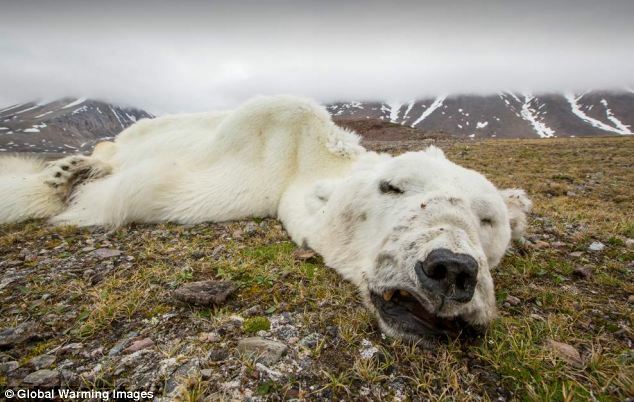 Not that I don’t believe global warming is in fact truly occurring …but one dead polar bear can ,in no way, verify that truth. Nor can one colder than normal winter substantiate the claim that global warming is a hoax. The photo and story of the “bear rug” as it was described accurately, was supposed to accentuate the pro-warming angle being plead by many. One starved polar bear “bearing” the torch for the global warming crusade. Somewhat slanted journalism in my opinion. I am an proponent of the global warming theory and I respect the many scientific -based organizations that put forth the growing evidence of sea – ice loss and warming trends in our planets climate. I feel ,however, that at times we try to hard to persuade the nay-sayers with unfounded propaganda that turns people away from the cause of protecting our planet. For the time being let’s just enjoy the fact that many bears arriving on -land in the southern Hudson Bay are healthy polar bears ready to wait out the freeze -up a little more comfortably this fall. Apparently the sky is not falling..just yet. Check out these rather plump bear photo’s taken just a couple of days ago by Churchillian Jody Grosbrink. Thanks for a balanced view, it’s most refreshing.